Sweep, vacuum, dry mop, or dry swiffer your floors regularly to remove dirt particles that will wear out your finish. Use thick felt protector pads on the bottom of your chairs and all furniture legs! The style we sell don't fall off! Be cautious of wearing high heels on floors, many will leave dents. Consider leaving shoes at the door. Keep your pets nails trimmed. Give them a rug to lay on to help them when getting up, or "windmilling" to get going. Place throw rugs at doors to wipe feet and keep grit/dirt from getting inside and ground into floors. When moving a heavy appliance like the refrigerator, roll it out on ¼" plywood to keep from denting the floor. Clean lightly soiled areas by wiping with a damp cloth and water, or use Polycare or Bonakemi spray cleaners. Occasionally wash your floors with the concentrate Polycare cleaner in bucket of water and rag or sponge mop. Do not leave puddles on your floor. Your mop should be damp not wet. Use only the recommended products; Polycare or BonaKemi, so that your floors can be recoated in the future. In 3-5 years consider having your floors recoated. Call for a screen and poly procedure to give your floors that newly finished look again. This will keep your floors from deep wear and tear and avoid full sanding in the future. We will lightly screen the floor and apply one or two coats of polyurethane. A floor with wax or film build up cannot be topcoated with polyurethane as it will not adhere properly. A screen and poly procedure will address the surface of your floor, but will not fix gouges, deep scratches, stains or discoloration of your floor. This procedure can be scheduled fairly quickly. 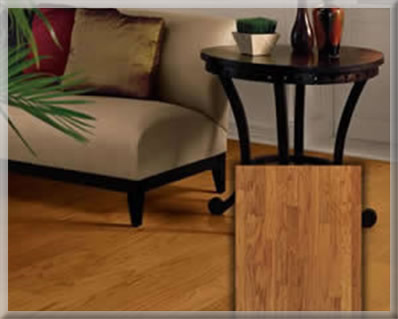 It is less intrusive to your lifestyle and much less expensive than refinishing. It's best to schedule a "screen and poly" at the early signs of wear on your floor. • Installation of retrofit stairs. Replace your carpeted or pine steps with oak.